Green sea turtles are endangered and are named for the greenish color of their cartilage and fat, not their shells. Their shell is wide, smooth and brownish-olive in zzz. They can be found in tropical and subtropical waters and migrate long distances between feeding grounds and the beaches from where they hatched. The females nest on the beaches where they hatched every 2-4 years once they sexually mature and will lay 100-200 eggs at a time. The eggs will hatch after about 2 months. The green turtle can grow up to 3-4ft and weight up to 700lbs, what makes them one of the larger sea turtles in the world. They can reach speeds up to 35mph and their lifespan is between 80 and 100 years. 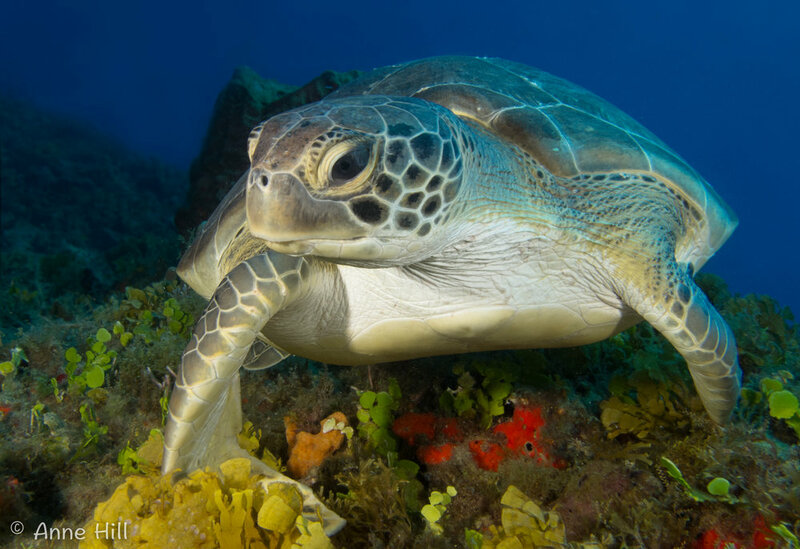 Green turtles can hold their breath for hours. They are cold blooded and the temperature of the water affects the ability to hold their breath what makes them able to hold their breath longer in colder water. An adult green turtle is considered a herbivore, and prefer to feed on sea grasses and algae as opposed to the juveniles that like to eat invertebrates like crabs, jellyfish and sponges.